"You'll find all the foods you like best meet the test, and at Bruno's you'll save more." 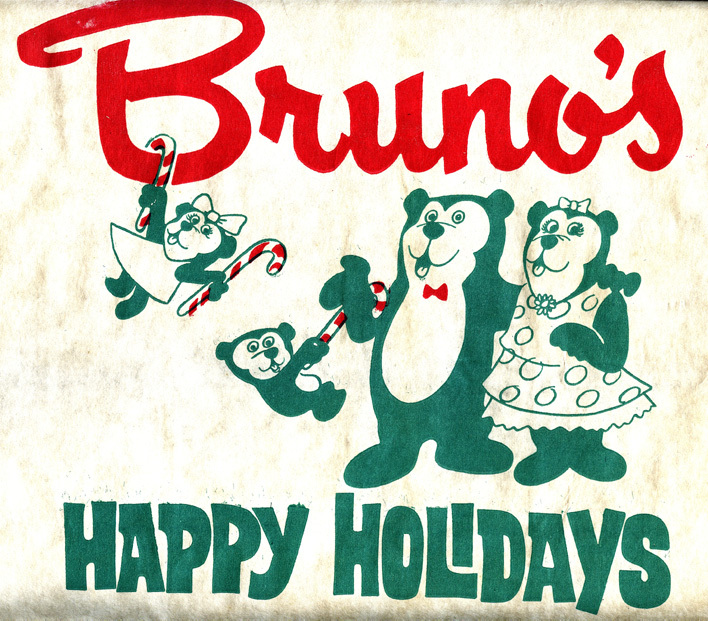 "Bruno's .... of Alabama .... takes good care of ... youuuuuu"
1971 advertisement featuring Bruno Bear and the original script logo for Bruno's. Does that B strike a sense of deja vu within? It should, if you used to patronize a certain drug store chain. Long after Bruno's discarded the above logo, the "B" lived on as the centerpiece of ... Big B Drugs! This was Bruno's foray into the pharmacy arena during the '70s. If it seemed like most of their locations were adjacent to Food Worlds or FoodMaxs, there's your answer! Big B Drugs sold out first to Revco in 1997, then the following year Revco itself was devoured by CVS, marking its entry into the South. Nearly all CVS locations in the state were originally Big Bs. Bruno's store at Five Points West, circa 1965. 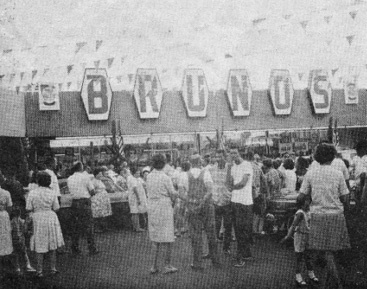 Grand opening of the Bruno's store in Dora, Ala. (Walker County), August 1968. By now they'd gone to using individual backlit hexagons for each letters ... this Bruno's signage is the one I remember. The fellow on the left looks more like Bruno SQUIRREL! On the right is the REAL Bruno Bear. But it seems most of the kids didn't care! 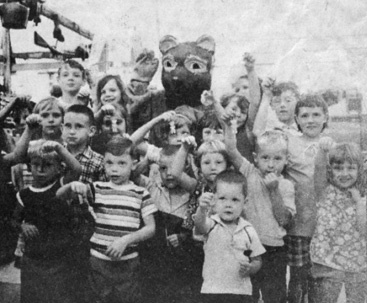 The guy in the front with the striped shirt is Tim Hollis, who submitted these pics. 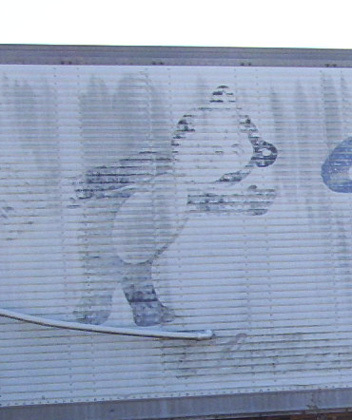 Does the bear in the ad below look like a dad-gum squirrel? An early, 'full body' picture of Bruno Bear. He's sharing center stage with Toppie the Elephant. Toppie, you might remember, was the mascot for TOP VALUE STAMPS, which Bruno's gave out for many years. From Tim Hollis' enviable archive of Birmingham history comes this shopping bag which he says is of 1979 vintage. Not only does this offer a rare glimpse of Mrs. Bruno Bear and their two requisite children .... but one of the last times The Good Bear was seen at all. Early in the '80s, Bruno Bear became extinct. His memory has thankfully been kept alive on some Bruno's store managers' nametags. Sherwin-Williams may cover the earth, but they didn't say nothin' bout coverin' BEARS! 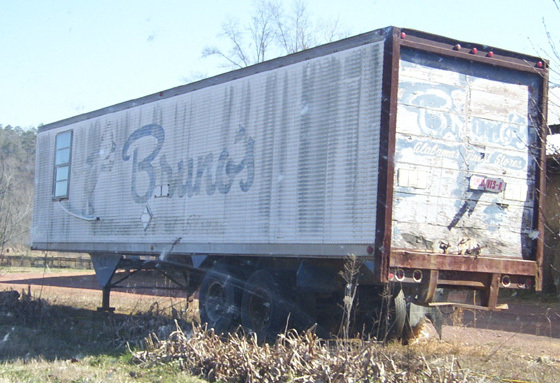 Here's the whole trailer -- the slogan reads "Alabama's Finest Stores"